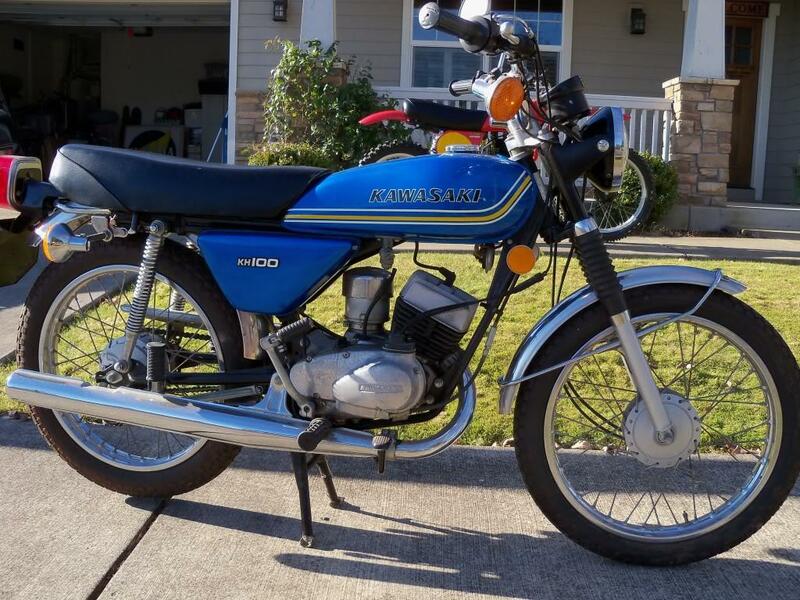 I haven’t had a Kawasaki KH100 before and never paid much attention to them. But I just stumbled across this example being sold by a gent in California who used it as a display piece in his dealership. It only has 17 miles on it! A lot of the road going 2 strokes of this vintage pull the fuel and oil directly into the crank. This creates a nice long lasting bottom end, but sacrifices performance. I suppose there isn’t much use comparing the 2 stroke technology of yesteryear to that of today because they are so sharply divorced, so I’ll spare you that for now. But what interests me about this particular model is the orientation of the carburetor. Where is it?! Do you see it? The carburetor is actually on the right side of the engine mounted transversely beneath the right side engine cover. It’s completely protected from the elements. This gives a very clean look to the motor, but of course a rather odd orientation to the air filter and intake. The air is pulled down through the top of the case, along an empty space along the top of the cases, then spills into the area behind the right side cover where it can be scavenged by the carb. A pretty interesting setup if you ask me! This allows the fuel (and oil) to be pulled in right by the crank bearings for better oiling. Some of these bikes came with the biggest god-awful chain guards ever conceived. Huge monstrocities that wrap the entire chain and sprockets from front to back. Thankfully many owners were smart enough to trash them immediately and run something smaller, or none at all. Personally I think these simple little two strokes look great trimmed down and cleaned up. If anyone has one of these rotting away in their garage or behind the house I’ll gladly take it off your hands. They would make for a great little project. I’ll leave you with a fantastic example from maker unknown. I’ve a 92 KH100 G8 – The last of the line. She’s now mainly used for charity fund raising runs. (See Team Two Stroke on Facebook). You’re right about the carb set up. Very odd but it works! i bought a kh100 after disc problem in my neck damaged strenghth to my right hand, its easier to manage little bike and upright riding position helps a lot. i wanted a kh100 when i started riding but took what came 1st and progressed on up through the capacity tree, hence missing out on the kh100’s. the kh i bought needed work which suited me as a hobby. i fitted fork seals, new kickstart shaft which involved splitting the crankcases and rebore and piston. new bulbs all round as when they blow they all seem to go at once, apart from indicators which are battery supplied. whilst i was fixing it a mate bought one and had been using it for a while and offered it to me for peanuts, i bought it and fixed its clutch problem and it was great. i finished my project kh and then i had two, both runners and tidy. i fitted a used micron expansion chamber exhaust pipe to I got off ebay to one and filed the exhaust port a little according to bucket racing websites advice. when i took it for a ride it was shocking how powerful the bike became compared to the standard bike, i was delighted, its mad as a box of frogs. expansion chambers are so fantastic on these bikes you have to get one and hold on tight. i go up to 70mph fast and huge clouds of smoke come out of it, its fantastic like a massive fog bank belching out its arse. trouble is you tend to ride the power band without meaning to and you ride like a mad man which gets tiresome. when i’m not in the mood for madness i get out the standard kh100 which is much more practical and quiet with lots of torquey midrange. these bikes cost peanuts and parts are all over the net so are easy to fix. best bits: kickstart, twin shock, six volt,magneto points ignition, alloy wheels, hydraulic disc brake, disc valve induction. i hope i haven’t bored you with all this, enjoy yourself this summer, happy trails people. 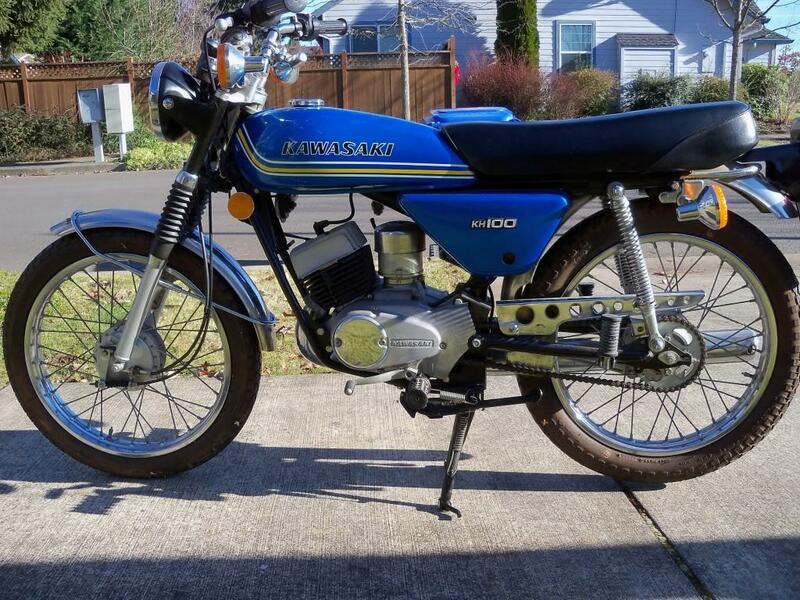 looking for a pair of side cover badges for my ’77 KH100. can anyone help? Does anyone know what exhaust was used on the blue KH100 racing bike pictured above????? Hei mr evan fell…that green kawasaki above from Bandung, West Java, Indonesia. This is my dream bike. I’d love to buy one but I’m not super engine savvy so I’d have a pretty steep learning curve. 1. Idles fine in neutral, but will kick and stall out when you put it in gear. Ok after it warms up, but I need to wait a few minutes. 2. Once running, it’s great for the first 5 miles or so. It then begins to buck and stalls. I want to work on it myself (here in Richmond, VA it’s tough to find someone willing to do it). We Just Found that bike and bought it for 50 dollars with less 488 miles. Thank you for showing that bike. i’ve kawasaki kh100 version but without the wheels. 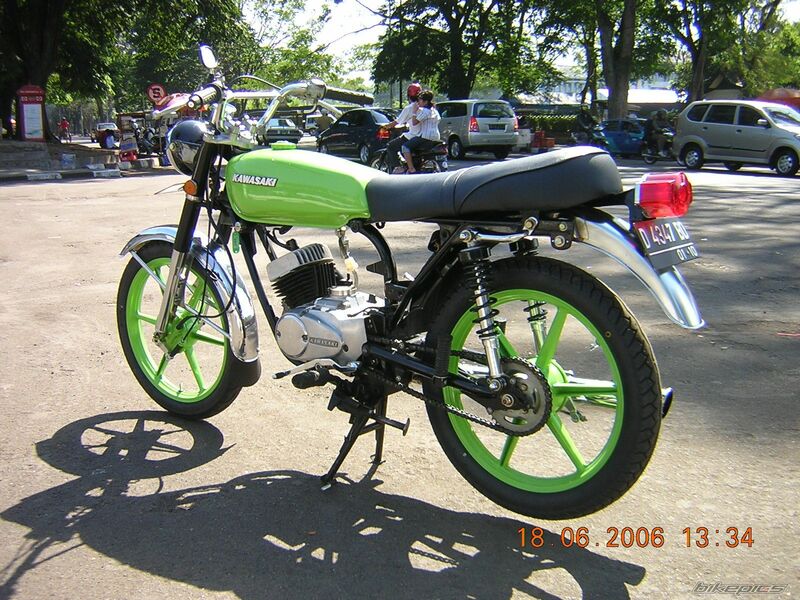 i’m looking for kh100es wheels a.s.a.p to restore my bike. I have a complete set of 7 spoke kh100 wheels for sale . 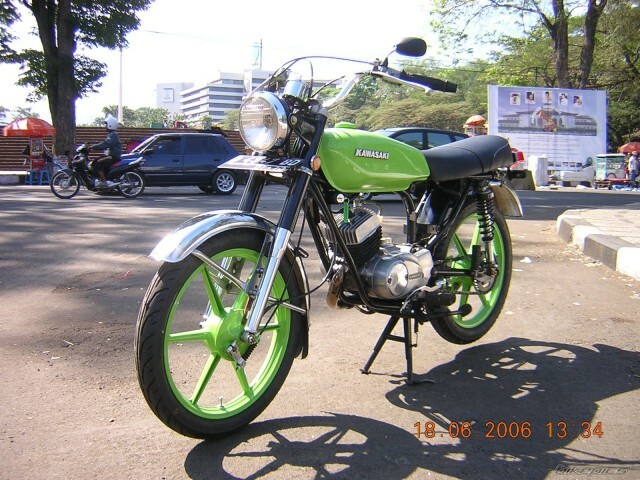 Hello guys, i have kh 100, i inherited from my late father, he’s been trying to restore the motorcycle, unfortunately he past away before he finished restoring the bike. I need your help. If somebody can send me a wiring diagram ang service manual… It would be greatly appreciated and make my father happy and proud… Thanks in advance..
You can Check Use Proxy and Anti Ban boxes to become use Boom Beach Cheat Tool Undetectable. Can i get your email sir ? Hello Kurt, i just bought the exact same bike as you have got and it came from the usa to the united kingdom, i paid £600 for it but indicators are missing of it just thought i would tell you regards dave, send me your email address and ill send you some pics ? 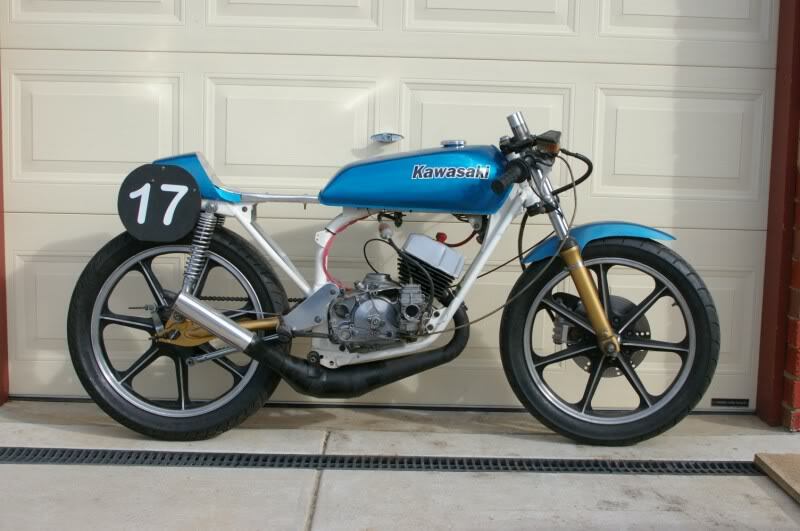 Hi,I check your blog named “1976 Kawasaki KH100 | Evan Fell Motorcycle WorksEvan Fell Motorcycle Works” like every week.Your humoristic style is awesome, keep up the good work! And you can look our website about daily proxy.